While diving in Indonesia, a group of activists came across two “sea cows” living in deplorable conditions and used social media to create change. While diving near the remote island of Kokoya, in Indonesia, a group of divers made a disturbing discovery. Reportedly, two dugongs – rare marine mammals which are closely related to manatees – were trapped inside of cages on the shallow ocean floor. One of the divers, Delon Lim, noted that the two “sea cows” appeared to be a mother and her calf held in separate cages. 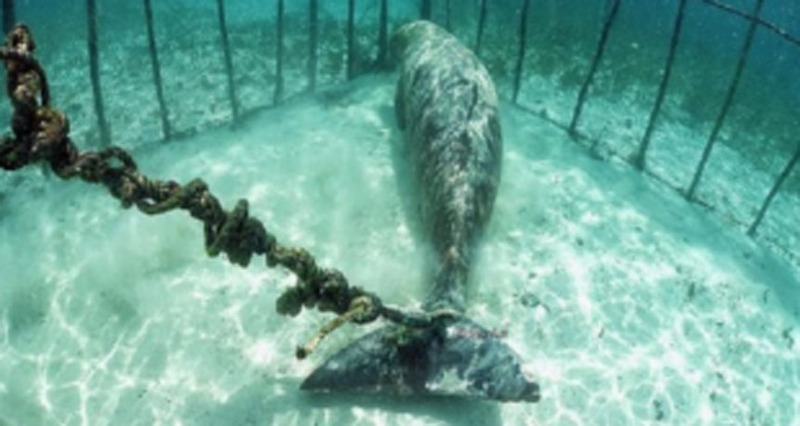 The younger dugong was free to float in her cage, but the adult was bound by a rope which wrapped around her tail. According to The Dodo, a fisherman had caught the two marine mammals and kept them in captivity to rake in extra money. Said Lim: “He asked for some money if we want to see the dugong or take a picture.” The activist believes the dugongs were held for at least a few weeks. “It seems so. The ropes are worn and torn. The scars and the wound on her tail are so deep. It was very heartbreaking,” he said.